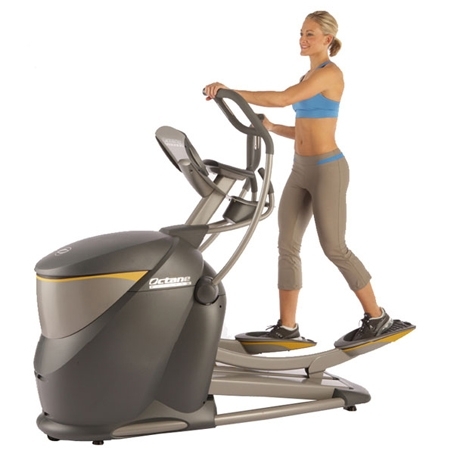 Our best-in-class elliptical trainer, this all-new machine is loaded with Octanes signature, breakthrough features designed to satisfy every member. This new best-in-class elliptical is packed with Octanes breakthrough features that make it a fast favorite among health club members. exercisers can quickly customize for walking, jogging and running paces, and for striding backwards. And Octanes patented SmartStride interactive ergonomics monitor pace and direction and automatically adjust stride length accordingly. The upper-body features dont get any better than the unmatched Converging Path handlebars that mimic natural movement and expand range of motion. Plus, the patented MultiGrip handlebars offer extra comfort, greater variety and more muscle use. New workouts, like the challenging 30:30 interval program designed by the experts at Athletes Performance, help maximize motivation and results. Convenience and comfort are optimized with fingertip controls on the moving handlebars, soft grip pedals and a personal fan.